Gary Madine scored an injury-time header to rescue a point for Bolton against Championship leaders Brighton, who finished the game with 10 men. Bobby Zamora teed up Dale Stephens for Brighton's opener after Ben Amos failed to deal with a cross, before Jamie Murphy added a second from close range. Neil Danns pounced on a loose ball on the edge of the area to pull one back. Murphy was sent off for a heavy tackle on Danns before Madine levelled after having an effort ruled out. The draw leaves Chris Hughton's Brighton unbeaten after nine Championship games, while Bolton avoided their fourth league defeat of the season to stay 21st in the table. Bolton's Max Clayton, in his first appearance for nine months after recovering from knee surgery, had a chipped effort tipped over by David Stockdale inside five minutes. Sam Baldock went close for Brighton while a deflected Liam Feeney shot tested Stockdale at the other end before the visitors stuck twice in four minutes. Former England international Zamora, making his first start for Brighton in more than 12 years, set Stephens up for the first, collecting Amos' fumble before working it back to the midfielder on the edge of the area. Liam Rosenior burst into the box and found Murphy, who steered home the second but Gordon Greer failed to add a third with a headed chance. Danns pulled a goal back after the ball broke kindly for the midfielder following Stephens' tackle on Madine. After the break, Rosenior had a double chance but was denied by Amos before sending the rebound over. Stockdale kept Madine out after Murphy's dismissal, and after the striker fouled the goalkeeper in an attempt to level late on, he eventually earned Neil Lennon's side a share of the spoils after meeting a Liam Feeney cross. "I think we got what we deserved and Madine got what he deserved. He has been knocking at the door for weeks to get a goal and that is what he is capable of. "He got up brilliantly and planted a fantastic header. You could see what it meant to myself and the people in the stadium. "We showed a bit of character, which is what we didn't show (against Huddersfield) last week. . We are a smidgeon away from being a good side at this level." "I thought we should have had 11 men on the pitch which allows us to apply pressure higher up the park. "I thought we were the better side, though we made it tougher for ourselves by conceding the goal we did just before half-time. "But I genuinely felt we were going to hold out. I couldn't see Bolton scoring, which makes it harder to take." Match ends, Bolton Wanderers 2, Brighton and Hove Albion 2. Second Half ends, Bolton Wanderers 2, Brighton and Hove Albion 2. Attempt missed. Prince (Bolton Wanderers) header from the centre of the box is high and wide to the right. Assisted by Stephen Dobbie with a cross following a corner. Corner, Bolton Wanderers. Conceded by Liam Rosenior. Goal! Bolton Wanderers 2, Brighton and Hove Albion 2. Gary Madine (Bolton Wanderers) header from the centre of the box to the bottom left corner. Assisted by Liam Feeney with a cross. Offside, Bolton Wanderers. Francesco Pisano tries a through ball, but Gary Madine is caught offside. Offside, Bolton Wanderers. Prince tries a through ball, but David Wheater is caught offside. Attempt missed. Liam Feeney (Bolton Wanderers) right footed shot from the left side of the six yard box is close, but misses to the left. Assisted by Tom Walker with a cross following a corner. Corner, Bolton Wanderers. Conceded by Rohan Ince. Substitution, Bolton Wanderers. Tom Walker replaces Max Clayton. Attempt missed. Neil Danns (Bolton Wanderers) right footed shot from outside the box is high and wide to the right. Assisted by Dean Moxey. Substitution, Brighton and Hove Albion. Íñigo Calderón replaces Sam Baldock. Attempt blocked. Stephen Dobbie (Bolton Wanderers) left footed shot from the left side of the box is blocked. Assisted by Mark Davies. Attempt saved. 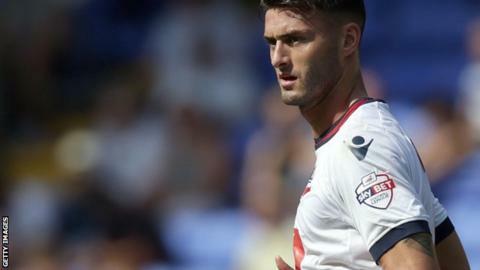 Gary Madine (Bolton Wanderers) left footed shot from the centre of the box is saved in the centre of the goal. Assisted by Max Clayton. Jamie Murphy (Brighton and Hove Albion) is shown the red card. Attempt saved. Liam Feeney (Bolton Wanderers) right footed shot from outside the box is saved in the top right corner. Assisted by Gary Madine. Substitution, Brighton and Hove Albion. Solly March replaces Bruno because of an injury. Substitution, Bolton Wanderers. Stephen Dobbie replaces Wellington. Corner, Bolton Wanderers. Conceded by Bruno. Offside, Brighton and Hove Albion. Beram Kayal tries a through ball, but Liam Rosenior is caught offside. Attempt missed. Prince (Bolton Wanderers) right footed shot from more than 35 yards is close, but misses to the left. Assisted by Mark Davies. Substitution, Brighton and Hove Albion. Rohan Ince replaces Bobby Zamora. Attempt saved. Max Clayton (Bolton Wanderers) left footed shot from the centre of the box is saved in the centre of the goal. Assisted by Wellington with a headed pass. Attempt missed. Liam Rosenior (Brighton and Hove Albion) right footed shot from the centre of the box is too high following a corner. Attempt saved. Liam Rosenior (Brighton and Hove Albion) right footed shot from the left side of the box is saved in the centre of the goal. Assisted by Dale Stephens with a cross.